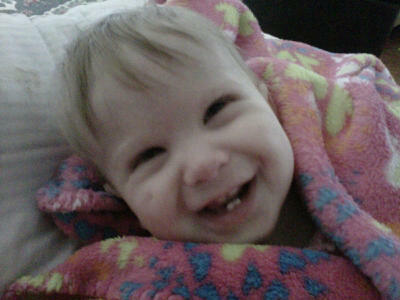 Rhema loves her hot pink butterfly blanket! It’s accompanied her to an EEG test, her ER visit in North Carolina and to the hospital for her recent surgery. She rested well last night and ate her bottle this morning. Right now her daddy is holding her and she is talking away and bouncing on his chest. I’m real pleased she has not pulled excessively on her bandages, she will just touch them from time to time. It is so encouraging to see her doing so well after such an extensive surgery. Thank you all for your continued prayers. A week from today she gets her staples out. Again, we are praying for no infection and no debris clogging any tubing. Also, we need to pray that as the new scar tissue forms it will not obstruct a tube like it did the first time.